When a baby is first born, no self-awareness is present. A baby does not think about what it does or who it is, and has no concept of its personality. As a result, baby naturally may think that mom is an extension of its persona. After all, baby was practically one person with mom for nine whole months, and now mom is the one who feeds it, changes it, and holds it all the time. Without any concept of self-awareness or object permanence – the understanding that something continues to exist even when it cannot be seen – it is natural that a baby would feel a bit unnerved when mom disappears. Baby then gets scared, believing mother is gone forever even though it’s not true. Once a baby is past the newborn stage, it begins to feel more at ease with short periods of alone time – that is, until the age of 6 or 7 months when it begins to grasp the concept of object permanence. While logic may say this realization should be helpful, as the baby now knows that mom has not disappeared, that is not usually the case. This is one of the most dominant reasons for clingy behaviour. At this stage, one can start to see the symptoms of true separation anxiety. Mom has left and baby wants her to come back. This phase may be easier for some parents than for others, but it is common to see separation anxiety peak between 10 and 18 months, and easing up by the time the baby is two years old. Clinginess does not always disappear when baby gets two year old, though. There are other factors, such as developmental milestones or illnesses, which may trigger a clingy behaviour. My little one was particularly difficult when he would go through a bout of teething. Irritations such as these can result in a child who seeks comfort in being held all the time. Lack of confidence or fear may also result in a clingy behaviour. Around 20 months, my son suddenly became afraid of playing on the playground, even when I was with him. He would cry and nearly have a breakdown if I tried to help him climb the stairs, demanding, “Up, please!” if I would not pick him up. So, how do you deal with the clingy phases without going bonkers? First and foremost, you need to practice patience. Easier said than done, I know, but it is really the best thing you can do. The phases will pass eventually, and sometimes there is nothing to be done about your clingy baby but to simply be patient. Now, there are also some methods you can try to help your child through certain stages, but again patience will be the key to success. Remaining calm and responding with a smile instead of frustration will help your baby respond to you more positively. After all, your baby behaves following your cues, and if you are visibly stressed, he will likely respond with more crying. If you notice that certain situations or places make your baby more clingy, it would be advisable to avoid them. This might sound like overprotecting at first, but think about it this way – if you had a problem with anxiety, you would avoid situations that made you overly anxious, at least until you were ready to deal with them. So no, you are not overprotecting your baby from the world, but rather not throwing them into the fire. For example, if a crowded playground makes the baby nervous, visit it only when there aren’t many people around. The same goes for your home; don’t bring more people over until the kid doesn’t stop being clingy around family members. Start by giving your baby short periods of time where he is encouraged to engage in solo play. Lay it on the floor with play gym or some toys and announce you will be right back. Give your baby about 5 to 10 minutes alone before popping back in. Repeating this and gradually extending your response time should help it begin to understand object permanence, making it more comfortable knowing that mom is always nearby. Bedtime can also be tricky. Babies and toddlers who are going through a stage of clinginess put up their biggest fight when it is time to sleep. Some children (my own included) from about 7 months old to a year, may absolutely refuse to sleep alone. This can make things particularly difficult for the mom, as you have to adjust your sleeping schedule to meet your child’s. In these cases, you can use a similar method to the one you used for solo playtime. Be ready to respond to your little one’s cries, but do not run in immediately. Start by giving it about 10 minutes to be alone, then you can peek in and let your baby know you are there to reassure it. Try this for a few nights before extending it for another 10 minutes, and so on until your child is able to sleep alone. One useful trick that will allow you to run errands and do chores is putting your clingy baby into a carrier. Just strap the baby to your chest and go on about your day. Besides allowing you to do what you need to do, the baby in the carrier will eventually become interested and intrigued with all the activities that it sees you performing (e.g., cooking, cleaning, etc.). This will make them want to engage in some of those activities and give them the urge to explore their environment. When this happens, you’ll finally be able to take a breather that you so need. It would be a good idea to have several different carriers for various purposes. So, for example, get a carrier that’s made of suitable material for bathing, a nice soft one for outdoor walks, and so on. If you’re worried about your spine, rest assured knowing that this is a temporary phase. Even though you will sometimes feel as if it’s going to last forever, it will most certainly pass. It is important to get the child’s attention occupied, and a perfect person for the job is the daddy. Once they get engaged in some activity, they will forget about mom and eventually overcome their clinginess. However, you have to do it gradually. The first step should be mom sitting in some comfortable spot (bed, sofa, armchair) and holding the baby in her lap. The father should try to entertain the baby in any way that proves to be effective. Make funny faces, talk gibberish, sing, dance, get some toys, whatever seems to work. Once you find your magic “tool,” play with the baby for about 10 minutes or so. When the dad gets all of the child’s attention, the mommy can try to put the baby down next to her. After that, mom should distance herself from the baby slowly, step by step, until she finally leaves the room. Don’t expect it to work right away, but as do this more often it will definitely produce some desired results. If you are returning to work or leaving your little one in childcare, set yourself up for success. Leave it with a family member that it knows or let it meet the caregiver a few times before leaving him alone. Always say bye-bye; sneaking out can make your baby uneasy for the next time you leave. Keep goodbyes lighthearted, and keep them final (without hesitation or coming back). 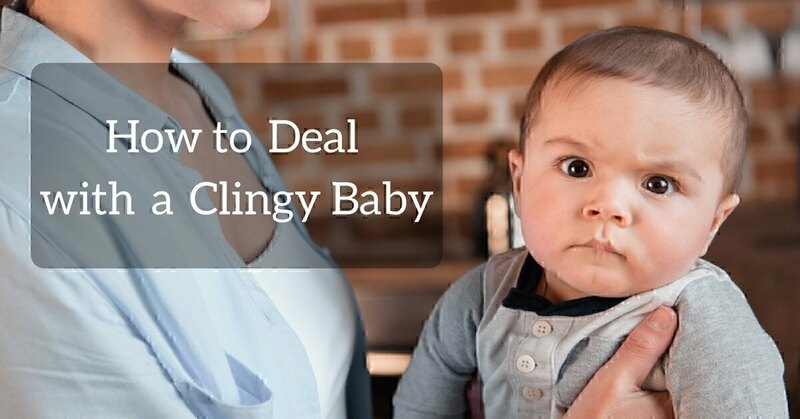 Dealing with clingy baby can be quite the stress. 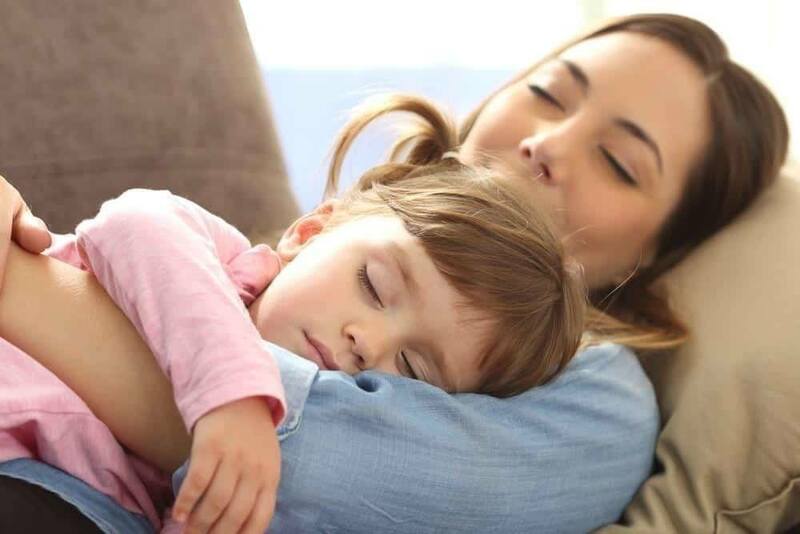 But, if you are able to follow these few simple tips, you can help your baby get through these trick clingy phases much more quickly and easily.